Time To Buy Solar Stocks? HomeBusinessTime To Buy Solar Stocks? The solar stocks have been dropping significantly over the last two weeks as global cut backs on subsidies loom. The fears are great that with austerity measures being pushed through, less rebates will be available solar. First Solar, Inc. (NASDAQ:FSLR) has fallen nearly every day for the last two weeks from a level of $163.00 to its current price of $133.23, -3.71 (-2.71%). Other solar stocks have been hit just as hard like Canadian Solar Inc. (NASDAQ:CSIQ) and SunPower Corporation (NASDAQ:SPWRA). Below are the key levels of support that look attractive as long plays. 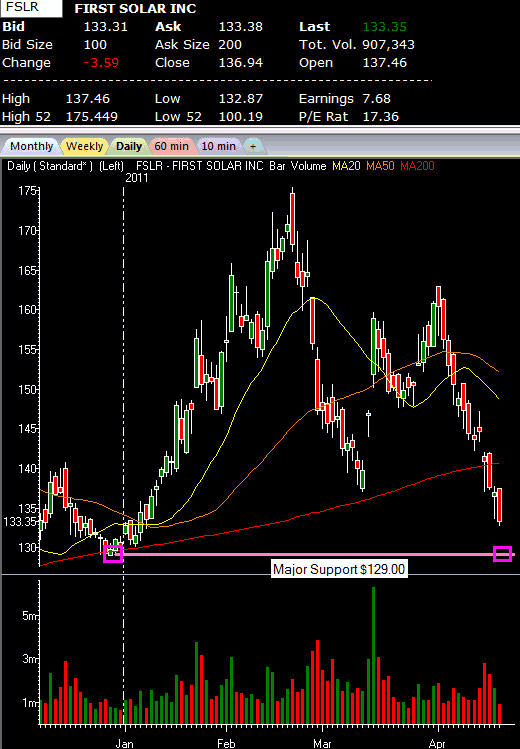 First Solar has significant support on the daily chart at $128.95. This represents a pivot low from late December 2010. A solid bounce should occur at this level. Canadian Solar has been hit the hardest of late, falling from $16.79 on February 18th, 2011 to its current price of $9.44, -0.11 (-1.15%). The major support to buy this stock is at $9.00. This will be a major support and with an oversold stock like CSIQ, a likely hard bounce level. Lastly, SPWRA is approaching its 200 moving average on the daily chart. Should it hit this level it will also coincide with a double bottom from mid March at $14.25. The solar stocks are currently being discounted based on fears of cuts to subsidies. Should oil stay strong, it is likely that demand will remain solid for alternate energy and a majority of solar companies will survive and flourish. These levels are the master supports in the short term and should be taken as solid levels to buy for a swing trade.